Length to width ratios and diamond measurements play a crucial role in a its appearance and beauty. When it comes to diamond education everyone knows about the 4 C's spanning cut, color, clarity and carat. There is one specific topic that combines the factors of Carat and Cut into one, and this what we refer to as the Spread on a diamond. Carat weight measures just the actual weight of the diamond while the spread, or face up measurements, is determined by the total depth combined with facet angles on the diamond. Just because two diamonds weigh the same, does not mean that face up they will look similar. We can liken this comparison to two people who are 150 pounds; one of those people are 5'5" tall and the other is 6' tall. Although their actual weigh is the same, the way it is distributed across their body varies greatly causing them to appear completely different. The same logic applies to diamonds. To gauge the spread, or how large a diamond appears, we recommend looking at the measurements as stated on all GIA grading reports. When you purchase a diamond at a specific carat weight you want to ensure it appears to be that size, or larger which will bring you greater value. 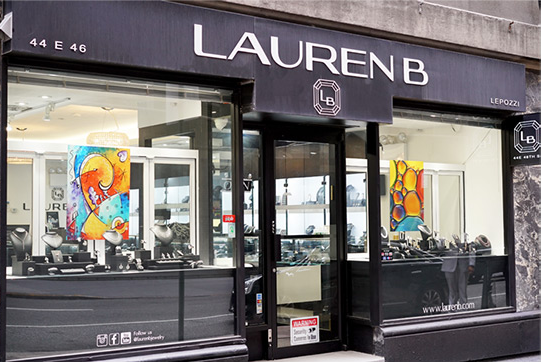 Watch this video here to view diamonds with measurements that make them appear larger than their actual carat weight https://www.laurenbjewelry.com/videos/index/view/id/6851. Please note none of these diamonds would be considered too shallow/flat which would make them both less brilliant and more likely to be damaged. Here is a quick description on each which can be applied to other diamonds as well. 1.4 ct Oval Diamond: Not only is this diamond spready for a 1.4 carat, it is large face-up for a 1.5 carat. Usually 1.5 carat ovals will measure about 8.7mm in length. The extra push to 9.06 really makes a difference in the finished look and it still stays within an acceptable length to width ratio. Last thing to note is the depth % is still high enough to give it a high level of sparkle. 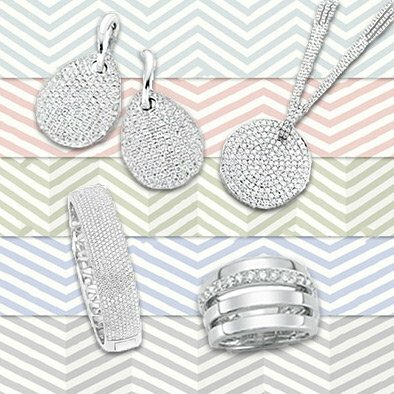 Caution: sometimes a diamond with a great spread will be too shallow, causing it to look dull and lifeless. 1.5 ct Round Diamond: While many round stones are made with excellent cut grades, that does not mean it has ideal face-up measurements; some can have depth percentages approaching 64% which will make the diamond pale in comparison to a more well-spead stone. This round cut measures 7.44mm in diameter, whereas the average 1.5 carat round will measure 7.3mm or slightly less. While .14 of a millimeter may not sound like a lot, in the diamond world it can make all the difference. 1.5 ct Radiant Cut Diamond: This diamond measures 7.75x5.81mm while the average 1.5 carat elongated radiant will have a 7.3mm length meaning this is .45mm above average. As with other elongated shapes, it is important to pay attention to the width measurement here which makes it fall within a desirable 1.33:1 length to width ratio. 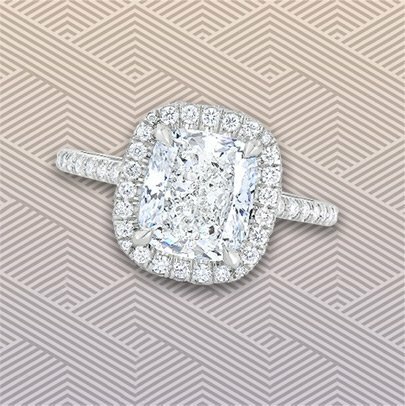 1.5 ct Cushion Cut Diamond: This shape is notorious for hiding a lot of weight at the bottom. However, this problem can be avoided by opting for a perfectly cut cushion such as this hybrid brilliant style diamond. These offer above average face up dimensions that also gives off a clear distinct sparkle likened to that of a round. This diamond measures 7.26mm x 6.38mm giving it the look of an average 1.7 carat cushion diamond. The length to width ratio of a diamond is a diamond’s millimeter length divided by its millimeter width. For example, if an oval diamond that is 10mm in length and 7mm in width; take 10 and divided 7 to get the ratio which will be 1.40:1 This ratio indicates the overall shape the diamond will take on and acceptable ranges for each elongated of the elongated cuts. While square diamonds have more standardized ratios in the range of 1:1 up to around 1.05:1, elongated shapes have more variables at play. 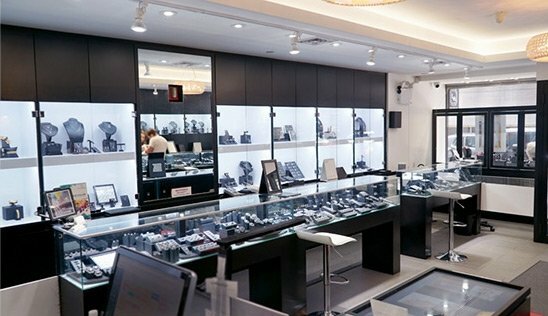 Deciding the exact ratio of your center-stone really comes down to a matter of preference and will not affect its beauty as long as you stay within reasonable paraemeters. Watch this video as you read along below on different diamond shape ratios: https://www.instagram.com/p/BUuRMqlBL2D/?taken-by=laurenbjewelry. Cushion Cuts: When searching for a more elongated cushion, the ratio will just be higher than 1.07:1. Take for example these 2 carat cushion cuts side by side. The one on the left has a ratio of 1.07:1 resulting in a slightly elongated look. The one of the left has a ratio of 1.14:1 giving a more visible rectangular appearance to the cushion cut. Radiant Cuts: For an elongated radiant cut you will usually find for ratios at approximately 1.2:1 and above. On the left we have a 1.17 ratio radiant cut which gives a fuller look to your elongated radiant. The one on the right is a 1.33 ratio giving a very rectangular and elongated appearance to the diamond and is a more common proportion for this cut. Emerald Cuts: In our sample video the 1.53 carat emerald on the left has a 1.34 ratio giving a fuller appearance. The emerald on the right weighing 1.50 carats has a 1.4 ratio creating a more elongated appearance. There are also emeralds with even longer ratios at 1.5 and 1.6 and these will have a very slim appearance. Oval Cuts: For a shorter look, stay within the low 1.3:1 to 1.35:1 range. For something in between, 1.35:1 to 1.45:1 is very common and gives a classic elongated appearance. Above a 1.45 will have a slenderer appearance and is the choice of many who want to maximize finger coverage. Avoid going well above 1.5:1 as you will start to lose the graceful rounded outline that this shape exudes. 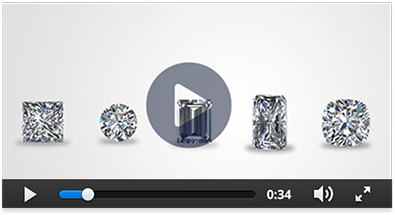 Pear Shapes: In our video, the pear shape diamond on the left weighs 1.5 carats and the ratio is 1.47:1. The pear shape on the right weighs the same and the ratio there is 1.57. Notice how different they look where one pear is slightly shorter and the other more elongated. For pear shapes we recommend anywhere from 1.4:1 up to 1.65:1 as a general rule of thumb.